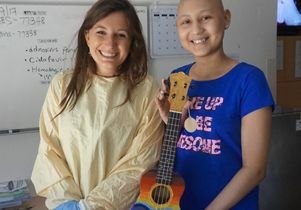 Jenna Bollard of UCLA Mattel Children’s Hospital, with Eldy Fajardo, 16, who designed and painted the ukulele and learned to play it during her music therapy sessions. UCLA Mattel Children’s Hospital has received a $100,000 grant from The Music Man Foundation to expand its music therapy program. The grant will enable the creation of two new music therapy fellowship positions to help serve the needs of pediatric patients in the hospital. The funding will also be used to support research on the clinical benefits of music therapy for premature infants in the neonatal intensive care unit. 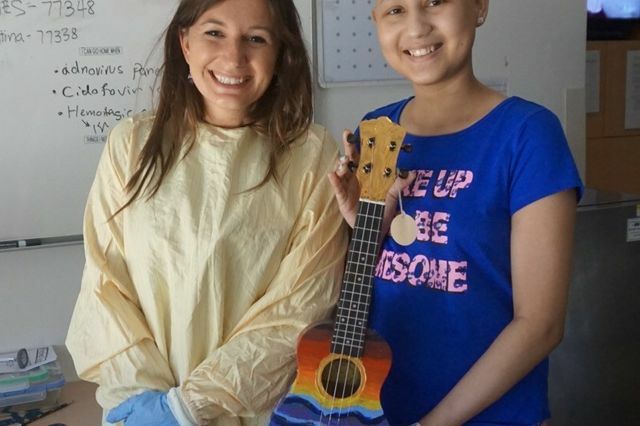 Sandra Cheah and Kristina Casale, who graduated from the Berklee College of Music, have completed their clinical internship with UCLA Mattel Children’s Hospital and will serve as the two part-time fellows beginning in June. UCLA Mattel Children’s Hospital was one of five organizations to receive a grant from the foundation, which provides funding to both core-curriculum music education and music therapy programs, this past year. The grant from The Music Man Foundation follows an earlier donation from the Peterson Family Foundation in June 2016 that funded creation of the music therapy program. The Peterson Family Foundation’s gift made it possible for the hospital to hire its first full-time music therapist, and its ongoing support ensures the sustainability of the program in providing comprehensive music therapy services to patients.